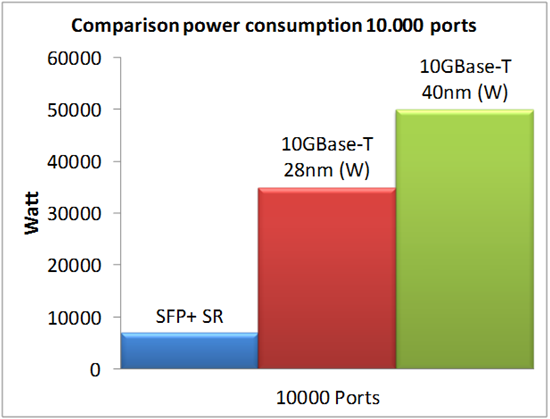 If I want to migrate our Data Center to 10G and I face the first problem: 10GBASE-T or SFP+. I understand this decision will affect to switches, servers and SAN (iscsi) and their interoperability, right? My first step is to allow 10 G in the switch, so does it must support SFP+ or 10GBASE-T? I want to create a new home network as fast, reliable and future proof as possible and I cannot decide which of the two interfaces should I use: SFP+ Optic or 10GBASE-T? The max length will be 20m. I don’t have any issues with the cost (as long as the cost differences between them are reasonable). Which one should I choose? Are there any switches (preferably managed) that support them both (at least two ports of each of them)? These questions were asked by network switch users. Maybe you have the same question. What’s the main difference when you choose the 10GBASE-T or SFP+? 10GBase-T works at 100 meters for Cat6A cable and up to 50 meters for Cat6 cable. Also it is compatible with 1G and 100m speeds, so you can deploy your switch ports and start using it to connect to existing 1G server ports and migrate the server ports as you can. Some comparisons of 10GBASE-T and SFP+ were list here by some experts and marketing managers, you can refer to the following comparison provided by Industry Perspectives. As power grid companies cap power supplies to data centers, IT managers have become sensitive to server power consumption. Data center managers aspire for the lowest possible power consumption technologies. It is important to note that for every watt of power consumed; typically two additional watts are needed for cooling. 10GBase-T components require anywhere from 2 to 5 watts per port at each end of the cable–depending on the distance of the cable–while SFP+ requires approximately 0.7 watt, regardless of distance. DAC–Direct Attach Cable (also known as twinax). Some vendors incorrectly call these 10GBase-CU or 10GBase-CR cables, but there is no IEEE standard at this time.